JABALIYA, Gaza Strip (AP) — An explosion struck the convoy of the Palestinian prime minister on Tuesday as he was making a rare visit to Gaza, in what his Fatah party called an assassination attempt it blamed on Gaza militants. The blast further complicated what already is a troubled reconciliation process between Gaza's ruling Hamas militant group and the internationally backed Palestinian Authority in the West Bank. It also cast a cloud over a meeting later Tuesday at the White House, where international representatives were to discuss economic development and the dire humanitarian situation in Gaza. There was no immediate claim of responsibility. Some officials in the Fatah movement quickly blamed rival Hamas for a "cowardly attack," while others said it was too early to say. Witnesses said the bomb was planted under an electric pole on Gaza's main north-south road and went off shortly after Hamdallah's 20-vehicle convoy had entered through the Israeli-controlled crossing. "I could not see anything because smoke and dust filled the air. When the smoke cleared, the explosion was followed by heavy gunfire, apparently from police securing the convoy. When the dust cleared, I saw people running everywhere, and police were running around," said a witness who declined to be identified because of security concerns. "This will not deter from seeking to end the bitter split. We will still come to Gaza," he said. Hamas condemned the explosion, calling it a crime and an attempt to "hurt efforts to achieve unity and reconciliation." It promised an "urgent" investigation. In the West Bank, President Mahmoud Abbas blamed Hamas for the blast. But his security chief Majed Farraj, who was in the convoy, said it was "too early" to say who was responsible. Hanan Ashrawi, another senior Palestinian official in the West Bank, condemned the "cowardly act" and said the perpetrators must be brought to justice. "We believe that this act targeted also all attempts at creating Palestinian unity, putting an end to the rift or the division in Palestine," she said. In November, Hamas handed over control of Gaza's border crossings to the Palestinian Authority. It was the first tangible concession in years of Egyptian-brokered reconciliation talks. But negotiations have bogged down since then. 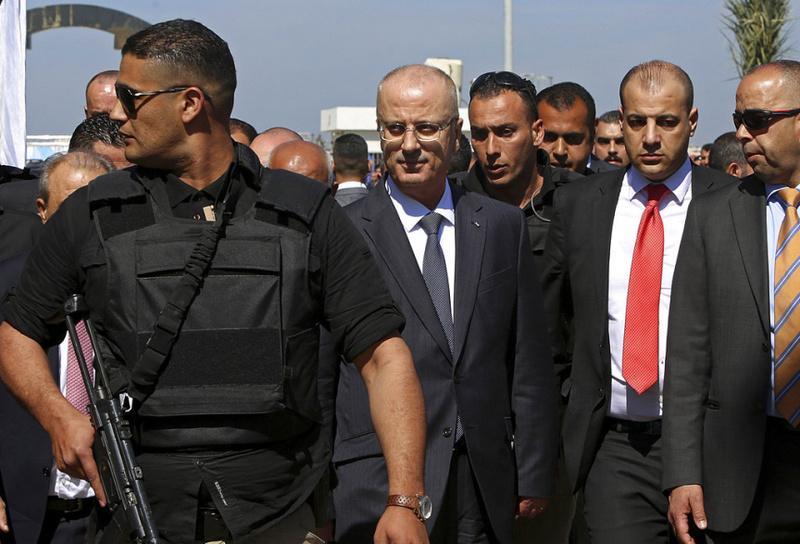 Hamdallah's visit comes amid a time of crisis in Gaza. The economy has been devastated by three wars between Hamas and Israel, and a decade-long blockade by Israel and Egypt meant to weaken the militant group. Hamas is sworn to Israel's destruction, and the U.S., Israel and other Western allies consider Hamas a terrorist group. White House envoy Jason Greenblatt has blamed Hamas for wreaking devastation on the territory. "The challenge will be determining which ideas can be realistically implemented in light of the fact that the Palestinians of Gaza continue to suffer under the authoritarian rule of Hamas," he said in a statement. The United Nations Mideast envoy also condemned the attack, calling it a "grave incident" whose perpetrators should be brought to justice. Nickolay Mladenov said until the "legitimate" Palestinian Authority takes power in Gaza, Hamas is responsible for enabling the internationally backed government to work without fear of intimidation, harassment and violence.